The Communication Rules each have an auto-generated six digit code. The Privacy Sources each have an auto-generated six digit code. 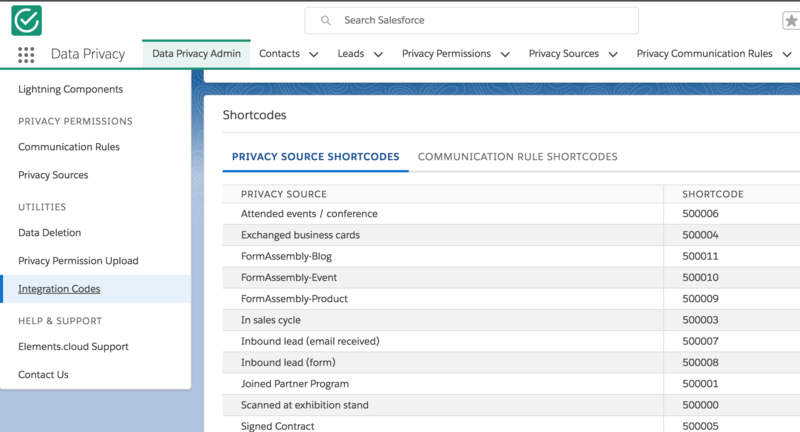 You can see the allocated codes in the Data Privacy Admin tab under "Integration Codes". Lead, Contact or Person Account records have a new custom field, “Communication Rules”, which is automatically updated with all the codes of the Communication Rules that the person is allowed to be contacted with. Rather than write Apex to manage permissions, you can simply create a Salesforce Task. This will add a privacy permission or unsubscribe from a specific Communication Rule for a Lead, Contact or Person Account . <optin> is not required and if set to true that the user has opted in. If the Privacy Permission needs to be extended then the Extend task can be used. This will create a Change Request on the Privacy Permission. This will extend the Privacy permission on the Lead/Contact/Person Account using the last created active Privacy Source with the provided psCode unless a specific Permission ID is passed in as a parameter. permission does not need to be there as it will use the most recently created one that has not expired for this subject. sinceLastExension is not required and will default to 7 if not set. If the Privacy Permission needs to be withdrawn then the Withdraw task can be used. This will create a Change Request on the Privacy Permission. The Permission does not need to be there as it will use the most recently created one that has not expired for this subject.